I would like to think that my children are quite tech savvy and always go for those games that push the creative envelope. For Christmas, we treated them to the PSVR, along with some of the best games currently available. To my utter surprise this week they’ve just started playing a VR game that is free and has been out for over a year. When the PS4 first released, if you purchased the PlayStation camera, there was a pre-installed game called the Playroom. It was a collection of augmented reality mini-games, which debuted the little AR Bots for the first time. 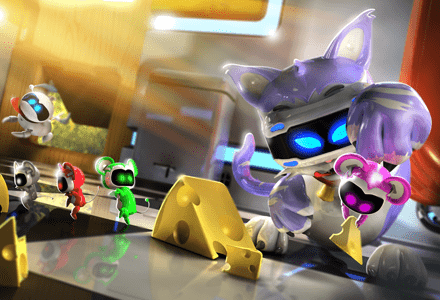 The release of the PSVR saw developers create a further experience with these mascots (now called the VR Bots), and again it was made free to anyone with the console and headset. The collection of mini-games has a greater emphasis on multiplayer fun, with the minimum requiring one headset and a Dualshock 4 controller. Gameplay is displayed on both the TV and the PSVR, so you can imagine the party atmosphere created by such a game. Become a cat trying to catch mice in the kitchen or fend off a sea monster rampaging through the city streets. The best part for my kids is that each playthrough earns you coins, that can be used in the virtual reality grabby machine. You play to win items that can personalise a home space for your little VR Bots. Items range from gym equipment, beds and arcade cabinets. If you have a PSVR headset and haven’t explored the PlayStation store for the free games available, add this title to your download queue and see whether it provides the same hours worth of entertainment my children have already had. Previous Post:What is restart fostering?